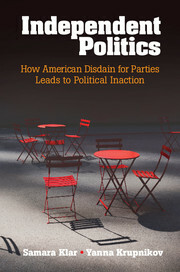 Samara Klar is the co-author of Independent Politics: How American Disdain for Parties Leads to Political Inaction (2016). She is an Assistant Professor of Political Science at the University of Arizona. She studies how individuals' social surroundings and personal identities influence their political attitudes and behaviors. Her work has been published in numerous journals including the American Journal of Political Science, the Journal of Politics, and Public Opinion Quarterly, and has been supported by the National Science Foundation. She has been recognized with a Distinguished Junior Scholar award in Political Psychology from the American Political Science Association and a Burns Roper Fellowship from the American Association of Public Opinion Research. Klar earned a PhD in Political Science from Northwestern University, Illinois and also holds degrees from Columbia University, New York and McGill University, Montréal.